Dynamite Jack is planting bombs underground. As expert bomb sweeper John Solver, can you solve the mazes and defuse the bombs? 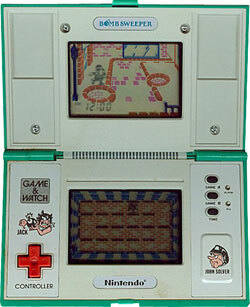 The lower screen shows a maze of walls. John has to navigate the maze and defuse the bombs that appear before the timer runs out. The maze is often full of dead-ends, but you can push walls that do not have another wall in front of them. The time remaining when you clear a maze is added to your score. When you clear a maze set you get 100 bonus points. If you fail to defuse the bomb within the time limit then it explodes and you get a miss. Three misses and the game ends. There are 10 mazes to play through. Reach at least one of Dynamite Jack's bombs and defuse it within the time limit. When you have cleared all 10 mazes, you play a scrolling puzzle to reach the final bomb. The walls move from left to right, and you have to push the walls to escape being crushed against the right-hand side. When you have collected the bomb from the scrolling maze, you will repeat the same 10 puzzles with a lower time limit. Play through 15 mazes in a row to defuse Dynamite Jack's bombs. After clearing all 15 mazes, you start a new set of 15 mazes. The mazes in Game B are always randomly selected. There is also a lower time limit than in Game A.